So we faced Sunshine Stars at the Yakubu Gowon Stadium Port Harcourt and despite a very good start, we found them unbreakable. 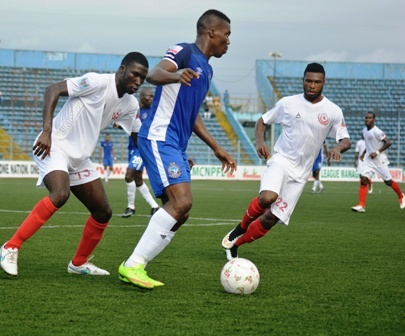 Like against Rivers United, they held off nicely, taking home a delicious away point. The story is that we just couldn’t take our chances. In the first half, we had enough chances to win three matches but we just lacked that killer instinct infront of goal. Chukwude, Mfon and Onuigbo all had chances but it would be unfair to ignore Ojo Olorunleke who had a fantastic game. Toward the end of the half, we were awarded a penalty. But Onuigbo hit the upright. I felt that when he picked up the ball, it was a good opportunity to open his Enyimba account but you know football is a funny game. When it just isn’t working for you, it looks like everything conspires against you. I’m gonna say this, that I feel for him, Onuigbo as I do for every other Enyimba player. What he’s going through is akin to what the team and technical bench is going through right now. The question isn’t whether or not they are good enough but the fact that it looks as though nothing just wants to go according to plan for them this season. We know this team, these players are a decent lot. We know Paul Aigbogun what he achieved with Warri Wolves in his time there. We know everyone of these players or rather most of them. Peter scored for fun at Warriors. So did Abu Azeez and Osadiaye at Wolves. Same can be said of the others. But at the moment, we are just only able to hit the woodwork. A good example is Ezekiel Bassey. Who forgets his exploits last season? There is no way that he has all of a sudden become Pius Ikedia. (No disrespect to Mr Ikedia but at least my message hit home). It has just been a strange season. We can’t keep talking about mistakes made at the start of the season. We know we made mistakes at the start of the season and some of them are biting us hard in the bumbum right now. Example is our dearly beloved pitch in Aba. That like some other decisions describe our season in a whole. In the words of coach Unaenuel, We are still in the three competitions even though we hardly anticipate a miraculous end to the season. There’s Zamalek next week and Nasarawa United in the Federation Cup. A couple of games left on in the League. We owe ourselves to finish as highly as possible. We look like we are outsiders for the League now. The guys at the top are running away with it, picking points at home and away and catching up with them is seemingly difficult now. So simply, we just take it game at a time, get what we can and see where we finish. It hasn’t been an ideal title defence by any standards and like I tweeted after the game, can the season end already?